KONANE resembles checkers and is played by two people. The object of the game is to maneuver your opponent into a position where he cannot jump any of your men on his next turn. 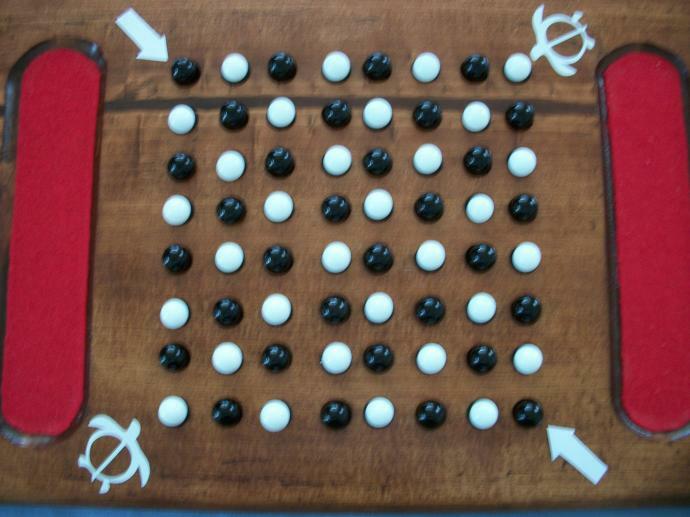 The players sit opposite each other at the board and both participate in placing the men in the shallow holes, alternating black and white marbles until the board is filled. One player than selects a marble of each color from the board and, with his hands behind his back, conceals one marble in each hand. He then presents both hands to his opponent who touches one hand, thus selecting the color of the men he will he playing with. The black marble always play first. 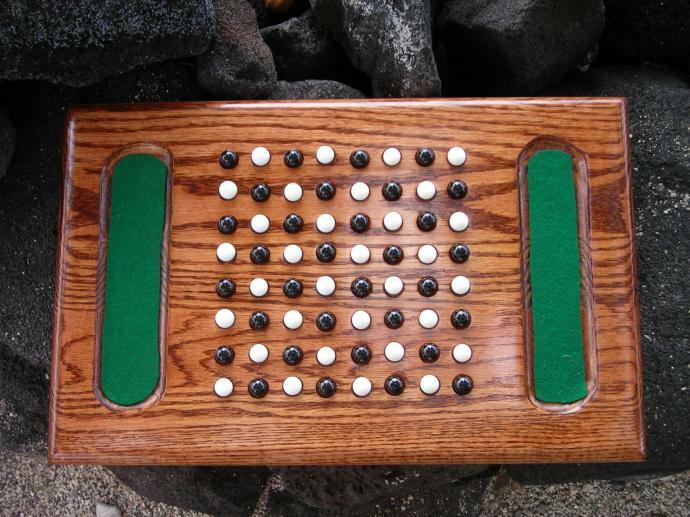 The two marbles used in selecting sides are returned to the board. 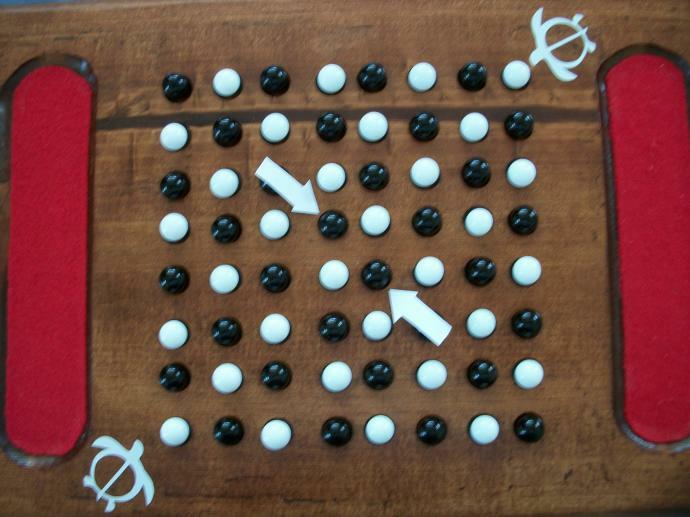 The first player than removes either (1) one of the two black marbles at the center of the board, or (2) one from a corner of the board. His opponent then removes one of his white marbles that is immediately adjacent to the empty space. Both of these marbles are set aside and the play begins. 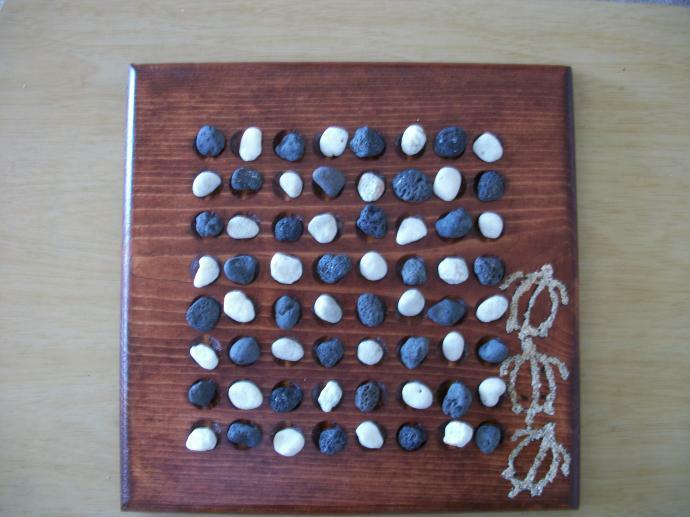 With two empty spaces on the board the first player now jumps one of the white marbles and removes it. All moves from this point on must be made by jumping one or more of the opponent's men. Jumping must always be towards, or away from the players, or to the right or left. A move may not be diagonal or in more than one direction in a single play. A player may jump as many of his opponent's men in a single play as he desires providing he ends in an empty space and that there is only a single empty space between the men he is jumping. A player, however, may elect not to take all the jumps available to him in a single play. He must make at least one jump, but then can decline to move further if he feels this is to his advantage. As the game goes on there become fewer and fewer men on the board, and thus fewer chances to jump an opponent. When a player cannot jump an opponent in turn the game is ended and the player who is unable to jump is the loser. (1) If a player is unable to jump, his opponent continues playing until he can no longer jump or until the first player is again able to jump. (2) The player with the most men left on the board when the game is ended is the winner. 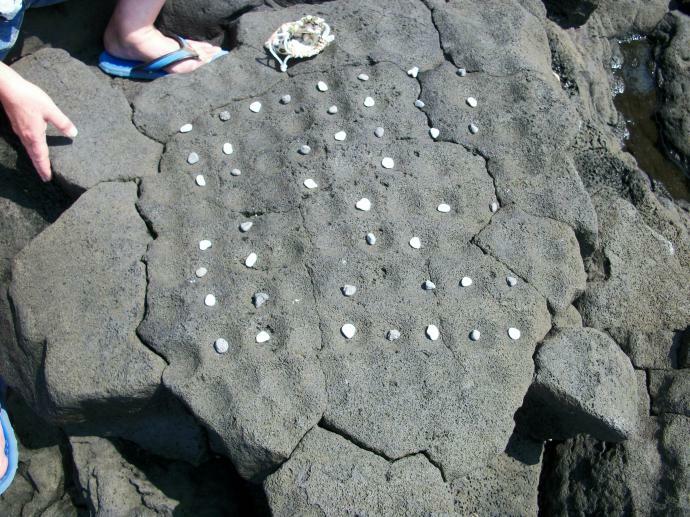 Ancient way to play the odd/even papamu. 1. can remove the 1st piece from anywhere on the board. Black 1st , white 2nd. 2. can jump more then one and change direction when jumping or not. With the odd/even papamu it is possible to win in 3 moves with 5 pieces removed from the board.